Ryan McLennan’s “The Crutch,” part of the “Out of the Ruins’’ exhibit at the New Art Center. In art history, romanticism has been the feeling side of the heart versus head paradigm, championing sentiment, heroism, and the sublime — the last, often by way of nature. Although artists have beat it back with realism, with minimalism, with random and logical approaches to process, romanticism stubbornly remains central to how we think about art. “Out of the Ruins: Reimagining the Romantic Tradition,” a group show put together by Elizabeth Thach at the New Art Center, looks at how some contemporary artists adopt the theme. Not surprisingly, it’s anxious art. There’s still a commitment to expressionistic beauty, but it’s as if the heroes are gone, and we’re left fighting off the wolves. Nature no longer stands in for the sublime — it’s filled with uncertainty and threat. “Blanche’’ is among the works in Susanna Coffey’s “Apophenia’’ portrait show. Ryan McLennan’s disturbing painting on paper “The Crutch” is anything but sunlit and pastoral. 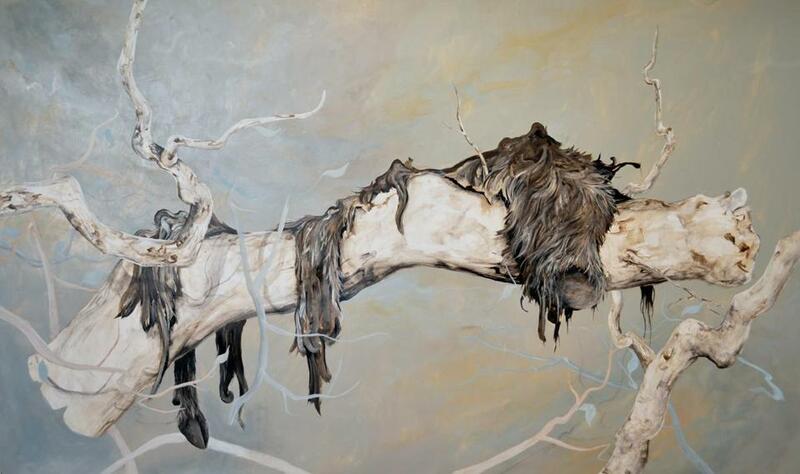 McLennan depicts the hairy hide of a hoofed beast, perhaps a goat, draped over a bleached, broken branch that floats in undefined, wispy space. What’s left of the animal appears to cling to what’s left of the tree, even though all life is gone. The romantic tradition sets artists up as geniuses channeling original work — which suggests that nothing influences them, other than some sacred creative source. We still cling to that idea, too, although artists can’t deny influence. Fred Liang’s ornate cut-paper murals draw on sources in Asian and Western art history. His “Fragments of a Floating Dream” depicts a ripe, full moon. Tendrils of clouds buckle off the wall in lacy constrictions. Sweet, but he drapes the whole piece in shiny black magnetic tape, like swipes of a razor through the froth. It’s not hard to challenge 19th-century ideals. The hard part is to show how we still hold fast to them. Christopher Carroll’s two-channel video “Passenger/Pilot” takes on the heroic mythos of the explorer in the wilderness. A man wanders through water into a tunnel, then he lights a flare in total darkness. It’s simple, compelling imagery, even once you learn that it was made in the Fenway, probably in the Muddy River. “Out of the Ruins” doesn’t fill the gallery well. It’s sparse, as if shrinking from its grand agenda. The smaller pieces get lost. But some of the work here shows that the pulse of romanticism still beats, even if that pulse is palpitating. 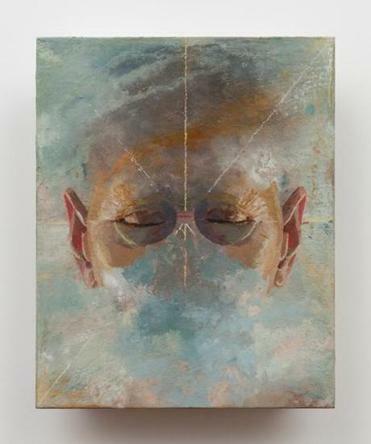 “Apophenia,” the title of Susanna Coffey’s portrait show at Alpha Gallery, refers to our inclination to make meaning out of random information, like seeing a monkey in the clouds. We’re wired to do that, maybe especially to find faces where there might be hints of them. Good art is a mirror in which we see elements of ourselves, after all. Coffey plays with figure and ground so that sometimes the portraits are overt, and sometimes they must be sought. She also paints masks, which insinuate that as hard as we look, we’re never going to see the real person in a painting. The most exciting pieces here equally blend figure and ground: There’s enough face to identify, but also a sense that it’s being subsumed. In “Surface,” eyes and a blue forehead are clearly evident rising from the bottom, but most of the painting is agitated with bits of color over white, and in “Blanche,” the closed eyes are the focus, paint rippling above and below into an icy fog. These almost graspable portraits may be the closest depiction of how well we’ll ever know anyone. Maybe particularly ourselves. Laura Wulf’s untitled piece from 2006 is in her exhibit at the Hallway Gallery. Since its invention, photography has stopped time, capturing a moment in an image. In his clever photographic inkjet prints at Ellen Miller Gallery, John Chervinsky attempts to capture time’s passing. Chervinsky sets up a still life, photographs it, then sends a cropped portion of the image to a painting factory in China. An anonymous artist paints that and sends it back, at which point Chervinsky inserts it into the original still life composition, and takes another picture. The results play with the familiar question of photographic realism in a fresh way. They toy with depictions of space, and time’s passage shows up in the juxtaposition of a painting of fresh fruit with the actual fruit, which has since puckered and rotted. Or Chervinsky uses calendars and timepieces. The one in “Hourglass, Painting on Door” shows time run out, but the canvas half-covering the hourglass depicts the upper half full. Then, he throws in lovely details — a snapshot tacked to the door, a reflection in the doorknob — that make these works deeply absorbing. Laura Wulf combines drawing with photography in her show at the Hallway Gallery. 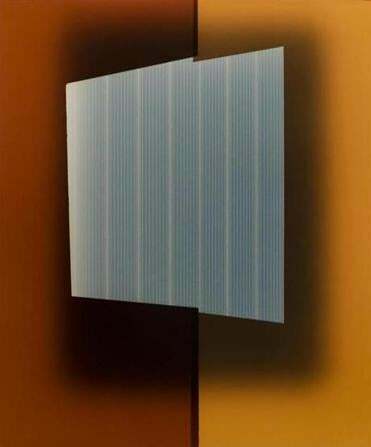 Exposing chromogenic paper to light, she creates color photograms by using strips of paper to manipulate how and where the light hits. Then she scratches and sometimes scrapes the surface, giving the works a bristling texture we don’t associate with photographs. Some of these untitled pieces are terrific — such as one with a ground in burnt orange and red, which has a jagged window of pale blue cut out of it, incised with stripes that look like frost. Cate McQuaid can be reached at catemcquaid@gmail.com.